Renzo Piano’s name sounds as harmonious and striking as his architectural works. The Italian architect is perhaps best known for his design of the Centre Pompidou, the unmistakable cultural center in the heart of Paris, and thirty years after its construction, Piano uses similar techniques in the new New York Times Building, but to a different end. 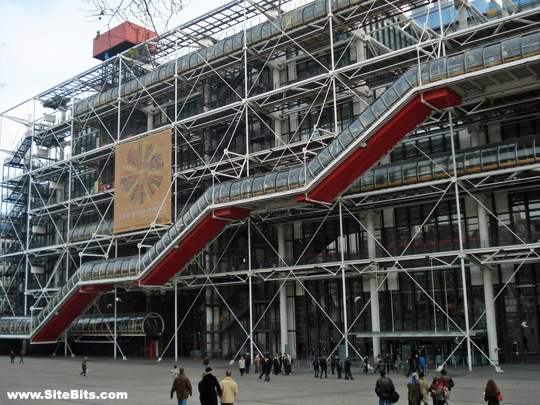 Completed in 1977, the Pompidou is recognized by its colorful exoskeleton. A glass escalator travels up the six flights and is visible from the street (hi, mom!). Mechanical tubes weave around the outside of the building, each a different color for a different function: green for liquids, blue for air, yellow for electricity, red for flow and I’ve been told the white tubes are linked to the parking garage under the center. There seem to be no exterior walls, only windows, allowing visitors to look in, through and out to the other side of Rue Beaubourg. The permanent scaffolding and walkways give the Center an unfinished feeling. With all of these disparate yet converging pieces, I can only arrive at one conclusion: the Pompidou is an architectural funhouse. My thoughts are supported by what’s inside—a modern art museum, gallery spaces, cafés, a bookstore, a cinema, a library... in sum, a cultural paradise where you could get lost and be entertained for weeks if not for the typical French Tuesday fermeture. The open meeting spaces and expansive outdoor piazza encourage gatherings of students eating sandwiches and caricature artists wanting to draw my overpriced portrait. Taking a step back from all of this, the most amazing part of the Centre Pompidou is how the city welcomed, absorbed and utilized the facility. Paris’s architectural body, covered with Haussmann’s six-floor immeubles, freckled with Gothic and Byzantine cathedrals and beauty-marked by the occasional arch or skyscraper, somehow integrated Piano’s sore, but brilliant thumb. I’m not a sociologist or Kevin Costner; however, I firmly believe that if you build it, they will come. Meaning, if you give people a multifunctional space that unites various cultural pastimes, they might think, “this modern monstrosity of a building is kind of weird,” but then pass through the glass doors and enjoy the facility’s offerings. On any given day, you can see France’s old guard oohing and laaing without bemoaning the Pompidou’s new-fangled façade. It would be enough to stop here and admire how Piano created a symphony playing form off of function, but with the New York Times Building, he revisits the same formal ideas that first stuck a chord with the Parisian public thirty years ago. Piano performs the same formal ideas while fine-tuning for the functions required by a private business center. The 52-story New York Times Building, completed last year, is the third tallest in Manhattan, which is no small achievement. The exterior recalls the transparency of the Pompidou with its usage of glass windows as walls. For a moment, standing on 40th street, you can forget that you’re gazing into an enormous skyscraper, as you watch cars whiz by on 41st, a testament to the displacement that Piano’s work can impart upon visitors. The lower levels are open to the public, containing stores and restaurants. Although it’s no museum, gallery, cinema or library, it’s enough to pique local businessmen and women’s interests during their lunch hours. To a lesser extent than in Paris, the mechanical activity is visible from the street as ceramic rods punctuate each floor and steel framing lines each wall. 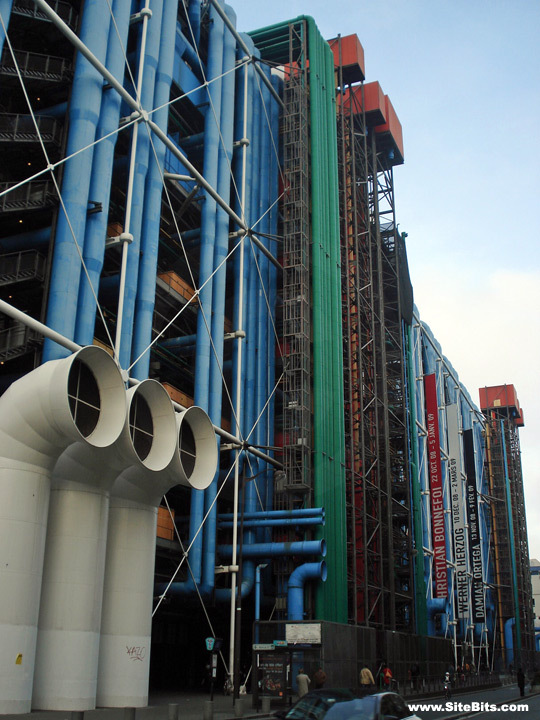 Piano wants you to see the structural workings of his building, as with the Pompidou. 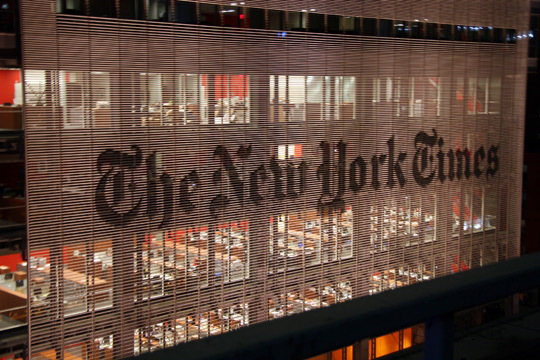 The huge lettering on the gate-like scrim reminds passersby that this is The New York Times and they’re trying to make a newspaper inside. Intriguingly enough, inside is also where you’ll find more Pompidou-like aspects of Piano’s design. Piano turned his exoskeleton right-side-in, perhaps because this building isn’t meant to draw the public, but rather to cater to those already inside. The floors are open and airy, and sometimes lined by balconies and railings. A set of staircases reminiscent of his Pompidou escalator snakes through the Times’ newsroom. These staircases truly provide a sense of movement and by extension, motivation. I’m not claiming that the editorial assistant feels particularly enthusiastic about delivering coffee to his superior, but in my opinion, Piano’s formal references to his 1977 work truly suits the vigorous hum of a twenty-first century periodical. While there are several similarities between the Centre Pompidou and the New York Times Building, Piano is no one-trick pony. It’s the different usages with respect to form that highlights Piano’s artistic genius. Both buildings are undoubtedly accomplished masterpieces that change the tune of cacophonous cities.